There is only one reason why Cocoa Marshmallow Cookie Dough Truffles came into being…Samuel. My delicious 8 year old is one of my biggest fans of Desserts Required. Samuel loves being a part of my YouTube videos and the pictures on the blog, as well as helping me bake and come up with ideas for future recipes. Two of Samuel’s favorite ingredients are cocoa (as in hot cocoa) and marshmallows (as in Marshmallow Monstrosity Cups). Samuel is, also, constantly asking me if the dough or batter has raw eggs in it because he knows that I am not inclined to let him lick the spatula if it does. I wanted to make something special for my baby boy this Valentine’s Day and thought that Cocoa Marshmallow Cookie Dough Truffles were the perfect way to show Samuel how much I love him. They are packed with cocoa, marshmallow fluff and are completely eggless. 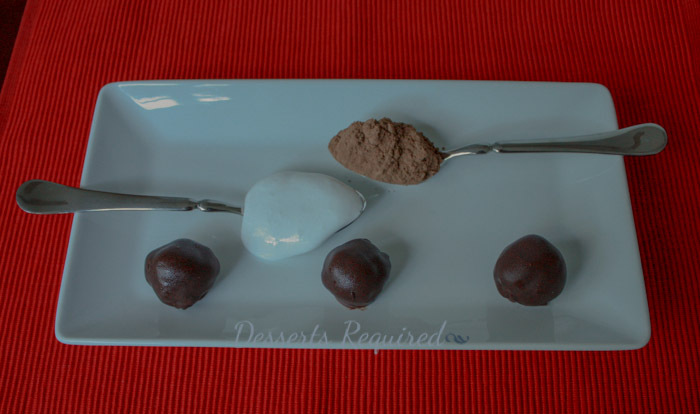 Cocoa Marshmallow Cookie Dough Truffles are incredibly easy to put together, which is a definite bonus. But, we all know that it is the taste that determines whether or not a recipe makes it onto Desserts Required. I am happy to report after taste testing more truffles than I care to admit that Cocoa Marshmallow Cookie Dough Truffles are wonderful. Best part of all is that you do not have to have an 8 year old in order to make these. I’m just thankful that I do! Sift the cocoa powder and whisk together with the flour. Set aside. Combine the butter, sugar and brown sugar together in a large mixing bowl. Beat until creamy, about 3 minutes, scraping the bowl down as needed. Add in vanilla and then the dry ingredients. Blend in 1 cup chocolate chips. Use a small cookie dough scoop (2 teaspoons per scoop) to scoop the dough onto the prepared pan. Freeze for at least 30 minutes before dipping the scooped dough into chocolate. Once the dough scoops are frozen, roll them between the palms of your hands to shape into balls. Wrap a second baking sheet with aluminum foil and set aside. Melt the remaining 3 cups chocolate chips. Dip the frozen cookie dough scoops, one at a time and transfer them to the second baking sheet. Freeze until the chocolate is set. Store in the freezer until needed. The amount of chocolate needed for dipping the truffles will vary depending on how large you scoop your truffles and how thickly you coat the filling. Wow, I never thought to use marshmallow fluff in truffles! I bet they were incredible,-thats an idea I have to remember! I LOVE marshmallow fluff. I’ll definitely have to try these! They look amazing! Awww, what a sweet treat for your son / head recipe tester 🙂 Can you believe that I’ve never made a truffle? Thanks so much! Marshmallows and cookie dough are an amazing combination. Hellooooo awesome combination. I never have marshmallow fluff around though! I guess I could make my own? I might be inclined to mush some marshmallows around enough until I have a fluffy texture! Or, you can make the fluff from scratch. Check out Desserts Required’s Homemade Marshmallows. Use the marshmallow while it is in the fluffy stage. Any leftovers can go over ice cream for sundaes or allow the mixture to set until it becomes full-fledged marshmallows. OH…MY…GOSH. I am a marshmallow addict. These look AMAZING!!!!! Must try! Your heartfelt Valentine of divine truffles makes me miss my younger niece and nephew…They would love your truffles, Betsy,,,And so would their Auntie K….So sweet that Samuel knows not to taste raw batter. He sounds like he is a big blessing. Thank you so much! You are so sweet. Perhaps it is time for a trip to visit your niece and nephew. Better yet, have them come to you…that is the best way to spoil them rotten!! These sound so decadent! Roll in graham cracker crumbs and you got a s’mores truffle!